Testimonies of Crypto Power Chlorella Users. Crypto Power Chlorella is a unique strain of 95% digestible green single cell, soft cell chlorella that also contains the blue pigment phycocyanin along with significant amounts of all three naturally occurring alpha, beta and gamma PPARs Peroxisome Proliferator Activated Receptors. For more information about PPARs, three naturally occurring food substances found in significant amounts ONLY in our Crypto Power ™ Chlorella, please click here. Cryptomonadales Crypto Chlorella Sorokiniana users. 1) My skin and hair became rather youthful (I am 63 years old). 2) My energy level remains high despite frequent 12 or 13-hour intercontinental flights. 3) Despite the food on airplanes and the food in different countries around the world, I have never even caught a cold. Cryptomonadales, crypto chlorella is the best all around product that I have ever come across. "For more than one year, I have been taking crypto chlorella about 20 to 30 tablets a day. My place of work is an international airport. I am in charge of several VIP hostesses who look after the arrival of heads of state such as prime ministers, ministers, kings and queens, dukes and earls, famous artists and personalities. This job requires a lot of organization and precision. The word "stress" is a mild form of expressing the tension and activity in our department. After work I had difficulty relaxing and sleep wouldn't come easy. In fact, I was sometimes so overworked that I could not eat my dinner. But, cryptomonadales chlorella has helped me to such an extent that I feel quite calm and relaxed after a real hard day of work. My skin complexion has become so nice and healthy looking, and my hair became so shiny and healthy. This product has saved me from becoming completely run down." "Since March 2003, I have been taking crypto chlorella tablets and I am happy to say that my body's systems returned to normal. I feel relaxed and full of energy after taking the product. It is really appreciated that this product came into my life, to restore my health and well-being." "In March 2003, I started taking cryptomonadales chlorella tablets due to the stress I was suffering. Since taking it, I have had increased energy levels and feel generally better. Along with changing my diet, I believe that these tablets have helped me lose a little over 11 pounds in the last 2 months. I have been very pleased with this product. I have recommended it to several people: one of which was my mother who had suffered from many ailments. She has only been taking these tablets for a couple of weeks and has already found her general health has improved and she has more energy than before." "In early July, 2003, I was given some small brochures, which contained information about crypto chlorella. At that time, my personal health condition was slowly deteriorating. The high strength medication prescribed by my doctor was not improving my health. I contacted the people who gave me the brochures and felt confident to try the product. I am now absolutely delighted to report I have experienced amazing results that have been achieved in just a short period of time. I have lost 22 pounds in weight since starting to take the product. I definitely feel more positive and I have much more energy than before, and strangely enough my eyesight seems to have improved. A big thanks to cryptomonadales chlorella!" I started taking cryptomonadales chlorella as well as changing my diet. I can now state that after 4 weeks of taking cryptomonadales chlorella tablets and crypto chlorella growth factor extract, C.G.F., I feel so much better and my general health has really improved. I am looking forward to a long and healthy life. Thanks to Cryptomonadales Crypto Chlorella." I want to thank you both for recommending crypto chlorella tablets for my husband. He is only 35 years old, and for the last three years has not been very well at all. He has been backwards and forwards to the doctors, who just keep giving him different medications to try which had several side effects, which only made him worse. He was like a thirty five year old man in a sixty year old's body. The doctors then decided to put him on anti-depressant tablets, and I knew that they would only make him worse, and I didn't know what to do anymore. Thankfully you told me about the cryptomonadales chlorella tablets, which my husband has been taking for about eight months now, and is feeling like a new person. He has lost over two and a half stone in weight, and now has the energy to play sports again, and spends a lot of time doing things with our two children outside on our farm, which he could never do before. Amazing. We now have a happy healthy husband and father, for which we are very grateful. It is certainly a load off my mind. I have recommended the crypto chlorella tablets to many of our friends that have witnessed how they have helped turn my husbands life around. Thank you both once again." For over 30 years I suffered from increasing digestive problems. Medication improved but did not cure the problem and shortness of breath became more noticeable as the years went by. I was introduced to cryptomonadales chlorella and I have to admit I did not have great faith that they would help. After only a few days, things began to improve and now after four months I am eating and enjoying food almost normally. I have lost several kilos which was almost entirely accumulated fluid and my lung capacity is defiantly much greater. Thanks to crypto chlorella I have a higher energy level and I have dropped two sizes in skirts and slacks. I have been taking cryptomonadales chlorella for six months now. I have found that the crypto chlorella tablets have improved my energy levels, decreasing the amount of fatigue that I have previously suffered. My digestive system is better regulated and I haven't suffered from as much gas as I normally do since taking the chlorella tablets. I have been taking cryptomonadales chlorella faithfully and will continue to do so for the rest of my life. International online orders for Crypto Chlorella click here. USA Trade name Crypto Power Chlorella. "The first thing I noticed after taking Crypto Power Chlorella for a period of time is that I never get tired. My weight has stabilized, and my immune system is functioning well because I no longer get colds. My body's chemistries are now balanced, and my tearing eyes have cleared up. 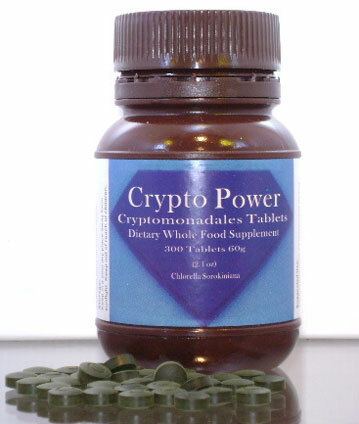 "I call Crypto Power Chlorella my 'happy pills'. Crypto Chlorella gives me good energy. This is the one supplement that I take more consistently than any other." "For me, the best advantage of Crypto Power Chlorella is that I no longer experience high-low health and energy levels. The shakes and weakness no longer cause me to grab something to eat just in case I would pass out. When I miss taking Crypto Chlorella 5 or more days, I begin to notice a feeling of weakness and low energy. The best side effect is I have lost 70 pounds over the last 3 years. If I get busy or Crypto Power chlorella is not handy, I find myself snacking all day long. " "I just started taking Crypto Power chlorella and I have not felt this good since my early twenties. You are just a much happier person when you feel good." "Our dentist remarked on the improved health of both my husband's and my gums. Over all, I would say our immune systems have been greatly strengthened since taking crypto chlorella." "I am sending my comments just to give you some idea of the way I check and enhance products. I used to tell my clients, you have to stop doing things like everyone else. If you go with the flow, you go where the flow goes. And almost everyone you see is sick. I am always looking for new and better health products. When checking a new health product, I give the hype a rating of 10 on a 1 to 10 scale. I then check to see how the product compares with the hype. On most things I only get zero to 6. I don't bother with a health product unless I get at least an 8. When I found Crypto Power Chlorella , that check gave me a 10, which said it may even be as good as you advertised. So I ordered some. Then comes the actual check of the product. First, I check its frequency in Hz. That gives me a good indication of the life force of the product. To me, life force is everything. On good organic produce you get 3,000 to 10,000HZ. Some things, of course, go much higher. I got a reading of 100,000HZ on Crypto Power Chlorella, which was 50,000Hz above any health products I had previously found. Needless to say, I have added it to my Super Food Mix, which is what I live on. I can't give you any health improvement testimonials. I haven't noticed any. I am almost 81 and in better health than I have ever been. I will continue using Crypto Power Chlorella to keep it that way." "One day, one of my three cats began to loose hair. My first impulse was to give her 2-3 tablets of Crypto Power chlorella. To my surprise, in just a few days, her hair was growing back again. We now give my cats Crypto Chlorella as often as possible. A German shepherd dog named Tara was very sick. After taking Crypto Power chlorella, Tara began to look better, have more energy, began to be playful, her hair had shine again. Her owner and family are now taking Crypto Power Chlorella themselves." "Crypto Power chlorella has provided me with better digestion and freedom from constipation. Since I've been taking crypto chlorella, I've never been better and more regular. Crypto Power Chlorella helps to send oxygen to the bloodstream and aids in digestion. 1 can't live without it. "I am 53 years old and have had a sluggish digestive system most of my life. Last year, I started using Crypto Power Chlorella. In about the third month, my bowel movement started really getting regular and I was feeling much more energetic. I have been taking Crypto Chlorella for about nine months now, and I am honestly feeling better than I've felt in years." "I have been taking Crypto Power Chlorella for the past several years. I have not had any colds or flu since taking them. I also seem to have more energy and stamina." "I originally started using chlorella because I worked in electronics and did a lot of soldering with lead. My research indicated that chlorella flushed heavy metals from the body among its many benefits. I have found that a fringe benefit of Crypto Power Chlorella is my bowels are regular and I don't suffer from periodic episodes of constipation. At 66, I have NO physical ailments and still take the stairs two at a time." "I was impressed with what I read about Crypto Power chlorella and decided to try it. My energy and mental outlook improved dramatically within a month and my immune system was also greatly enhanced." "I have been taking Crypto Power Chlorella for about six months along with daily carrot and other vegetable juices, supplements, and conventional medicine for my condition. "I started taking chlorella because I had all my amalgam fillings removed from my teeth and replaced with porcelain. What I found out was what a wonderful product crypto chlorella is for your general health and well being. I soon noticed that I had exceptional stamina and endurance and felt great. I know that my immune system is strong. I can not remember having a cold or flu since taking chlorella. I prefer Crypto Power Chlorella to any other chlorella product because Crypto Power Chlorella works better with fewer tablets." "I have used Crypto Power chlorella for years to help cleanse and detoxify my system and to maintain a state of well being. I credit my overall good general health to Crypto Chlorella . Crypto Power Chlorella also aids in keeping my bowel clear and thus free of poisons. I have restarted my raw vegetable juicing regime and continue to use Crypto chlorella each and every day. This is a health routine that I plan on using the rest of my life." "The loveliest testimonial for Crypto Power Chlorella comes from my cat, who recognizes the excellent effects and asks for it eagerly as a treat. Trusting the intuitive craving of my feline companion, I offer her appetite for it as the most honest endorsement of all." "Since taking Crypto Power chlorella, I have fewer colds. If I do catch something, it is milder and of shorter duration. I also feel that I have more energy. I am 55 years old and recently went through menopause with only the mildest of symptoms. 1 also have no gray hair. Could your excellent product be helping in these areas or is it just heredity? Thank you for Crypto Chlorella!" "I will be happy to tell you that from taking this wonderful product, Crypto Power Chlorella, I have maintained my health and stamina consistently. Even though I work with the public and am exposed to all types of colds, sneezes, flu, etc, I simply take an extra dosage of Crypto Chlorella for a couple of days and I am perfectly fine. Crypto Power chlorella provides me with energy, keeps me regular, digests foods well, keeps me healthy and going strong!" "I have personally noticed improved eyesight since taking Crypto Power Chlorella. I increase the quantity I take when I am outside working around turbine engines and I notice that my eyes go through a little detox, clearing out the pollutants I was exposed to during the day. Also, I have nicer skin texture. Every woman likes that!" "My family and I have been very happy with Crypto Power chlorella. Crypto chlorella has helped to balance my body's chemistries. Our children have started taking it also. They feel it wards off colds and boosts their immune system." "Recently, I had an outstanding experience with Crypto Power chlorella that urged me to reorder after I had almost run out. I had taken a road trip for a day, intending to go to New York from Florida. After a day driving, I was very stressed out with a sick dog. I came back home the next day and noticed I just wanted Crypto chlorella. I felt I really needed it. Then I found out that Hurricane Wilma was coming, and during the week preceding and the time after with the power out and the noisy generators nearby and cleanup, I took Crypto Power Chlorella as a staple. It must help combat stress for Crypto Chlorella helped me overcome stress during that very stressful period." CR-1 300 tablets of Crypto Power ™ Chlorella. 60g. A 20 day supply. please call the number below or (Email) Contact us "We value your privacy"
Free shipping on all International orders of Crypto Chlorella. Crypto Chlorella International online orders please click here. On Sale: Buy 4 bottles, get 1 bottle free. USA only. CR-EX 100% pure Powdered chlorella growth factor extract. CGF in veggie capsules 60/280mg - 1 to 2 month supply. Call for our special USA only price on CGF. Personal Testimonies on Crypto Power Chlorella, Chlorella Growth Factor. Our Crypto Power USA prices are not posted on our website. Ordering Crypto Power Products in the USA can only be done offline by phone or online through a Pay Pal invoice. If you are in the USA and would like to place an order right now or if you have a question about prices and shipping costs, please call Mike or Shoko. Toll free: 1-800-654-4394. Or contact us by E mail. Pay Pal accepts visa, master card, discover, amex and USA verified pay pal accounts. In order to send you a pay pal invoice for crypto power products, I will need your exact order, your phone number, your zip code and your E mail address. Please phone or contact us by E mail. Please be sure to include the requested information above. If you call us, unless it's after hours, you will get a real live human being. Mike or Shoko will both be happy to take your order directly and ship to you as fast as possible. You may also fill out our online fax order form and securely fax your order to 540-348-3442. Faxed orders can only be processed with USA bank based Visa, Master Card or Discover card credit or debit cards. Only Shoko and Mike have access to your faxes and personal information. We have been in business since 1990 and on the web since 1996. Your information is safe with us. All information submitted to Shoko's Natural Products is kept in the strictest of confidence, no information will ever be sold or shared with a third party and no credit card information will ever be stored by us on a computer system. To achieve best results, it is recommended you take a minimum of 10-15 tablets in the morning and 10-15 tablets in the evening with plenty of water. Once your health goals have been achieved, a reduction to 5-10 tablets twice a day should be sufficient. If the product is taken daily as recommended - you may feel healthier after 2 weeks and good results will be achieved within and up to 120 days. Results, however, will vary with your diet and lifestyle. The elimination of toxic substances from your bowel is a very important factor in achieving health. In most cases foul smelling feces will leave your colon during the first 2 to 3 days after taking Crypto Power Chlorella (Cryptomonadales crypto chlorella sorokiniana). Crypto Power Chlorella, Crypto chlorella sorokiniana, 95% digestible single cell, thin soft cell-wall chlorella algae. For more information about PPARs, three naturally occurring food substances found in significant amounts ONLY in our Crypto Power Chlorella, please click here. Good health is your choice and your responsibility so choose wisely. Crypto Power chlorella sorokiniana has a 95 % digestibility rate in 2 hours and it contains a much richer array of nutrients than any other chlorella product. This is a truly raw, vegan, whole super food, never processed above 140 degrees F.
Dr. Javier Montiel. (English and Spanish speaking). Dr. Montiel is also our Crypto Power Chlorella distributor for Mexico. Mexico or the San Francisco / Modesto area of California. Crypto Power Chlorella distributors in the USA.